Osaka Elegy (Naniwa Erejii) is an early black and white film from the canon of Kenji Mizoguchi, one of the Big Three Film Masters from Japan, along with Yasujiro Ozu and Akira Kurosawa. Released in 1936, this 71 minute long early sound film has some good moments but is filled with unsure technique. Compared to later Mizoguchi masterpieces like Sansho The Bailiff and Ugetsu, this is like watching a sketch of greater things to come, a Protoceratops vs. a Triceratops. It was also the director’s first critical and commercial success. It is a very simple film, in terms of narrative and technique, and its ending is rather abrupt, if realistic. It follows the downfall of a young female switchboard operator at a pharmaceuticals company. Much of the critical ballyhoo for the film is predicated upon the claim that the film examines a changing Japan’s social mores, and how women suffer at the hands of weak, venal, and selfish men. But, a closer examination of the film lends a not so simple reading. Yes, most of the men in the film are weak, venal, and selfish. But, what is failed to be mentioned in most critical accounts of the film is the fact that its heroine, Ayako Murai (Isuzu Yamada) shares those three qualities in spades. That this obvious fact is missed shows just how poor most film criticism is, and how easily blinded by politics critics, in general are. In fact, the film is better for not being as cardboard as portrayed by its politicized champions. Credit for this falls on the screenplay by Mizoguchi and long time screenwriter Yoshikata Yoda. Ayako lusts for a young worker, Susumu Nishimura (Kensaku Hara) at the company she works for, but he seems oblivious to her. She finds herself then being pursued by the company’s old owner, Asai (Benkei Shiganoya), as a mistress. He has been henpecked to death by a shrewish wife Sumiko, (Yoko Imemura), who basically calls him a coward for not seeking a younger mistress. The wife is every bit as poor an example of humanity as the rest of the characters in the film, and the viewer subtly hopes the owner will cuckold her. Ayako sees Asai as her way to pay off an embezzling debt her debauchee father (Seiichii Takekawa) incurred at his own company. There are some interesting scenes of her with Asai; especially a humorous scene of her being caught at a puppet theater by his wife. An employee, Fujino (Eitaro Shindo), of Asai’s comes to his rescue. A bit later, though, their affair is outed, and Sumiko bans Ayako from ever seeing her husband again. She then takes up with the employee that bailed her out at the theater. Things get a bit dicey between her and Fujino when Ayako learns that the young man, Nishimura, at the company she worked for (she had left when she became the owner’s mistress) wants to marry her. She then threatens Fujino, with the duped Nishimura’s help, and Fujino then turns on her, calls the cops, and she is arrested. Separately, she has also become estranged from her younger sister, Sachiko (Chiyoko Okura), her older brother Hiroshi (Shinpachiro Asaka), and her father. In an interesting scene, she helps pay for her brother’s college tuition, just as she paid off her father’s debt; but the father steals the money she sent for her brother, meaning that he never learns of her generosity- a fact that explains their face to face meeting. Nothing ever comes of this fact of the father’s theft, though, which reflects real life, not a movie made set up for some faux emotional or plot-driven payoff. Sadly, not a critical take on the film, that I’ve read, mentions this fact; instead repeating fallacies of the plot. Her father then picks her up at the police station, after she has admitted to threatening Fujino, and having heard her young suitor proclaim his innocence. What’s interesting is that many reviews of the film portray Nishimura as somehow using Ayako, when clearly the reverse was true. And he does not abandon her, he disentangles himself from a young woman who has lost her ethical ground. Upon return to her family home, she is spurned by all three of the others in her clan, especially Hiroshi. She leaves the house, at night, and heads toward a bridge. It seems likely that she will jump off. 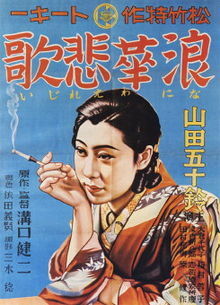 But, even here, we see Mizoguchi is not a schlockmeister, nor even a mere hack, but a director with a sense of vision (limited as it may be in such a melodrama), for Ayako, after a discourse with the doctor (Kunio Tamura) of her first lover, the pharmaceuticals owner, just walks along the bridge, and straight into the camera, as the film ends. The interesting thing is that it is really the only true closeup the film gives us of its protagonist. What I’ve described is a faithful rendering of the action onscreen, yet it’s truly remarkable to read many reviews that call Mr. Asai unscrupulous, or Fujino lecherous, when they are merely carrying on a tradition in Japan, yet wholly portray Ayako as a victim of men, when she clearly seeks out her role as mistress. What actually makes her interesting is that while she is a victim, to some degree, she is mostly a victim of her own greed and overweening ego, as well as simple stupidity. She’s simply not that likeable nor intelligent a character. Yet, that actually benefits the film’s end, for it makes one wonder if a turning point in her life has been reached, and not if she is merely going to continue with her self-destructive behavior. It’s also amazing to read that Ayako’s brother Hiroshi and younger sister, Sachiko, have been sponging off her, when this simply not so. Hiroshi is off at college until late in the film, and is not living off his sister. The DVD, from The Criterion Collection, is one of its Eclipse Series, #13, which means it’s no-frills. Not only are there no extra features, but there is no video restoration done. While it would be great to see the films of such a master restored, and have the options of an English language dubbing, as well as an audio commentary track, this is usually not a problem with most of the Eclipse titles I’ve seen. It is here, though, because the print chosen is simply of an inferior quality. The picture frame is often dark and muddied, in a 1.37:1 aspect ratio, with many imperfections and flaws, as well as very bad edits and cuts. Additionally, there are several moments where the frames seem to actually shake, as if the frames have been miscut into the film stock. All in all, this is one of the worst film transfers for any Criterion title I’ve seen. And, the audio is also very hit and miss. One wonders why they decide to go cheapo on some works and not others? After all, people will still be watching Mizoguchi films in a few hundred years, even if this film is not the equal of later masterpieces. Who, though, will be watching The Royal Tenenbaums, Armageddon, or The Life Aquatic? Would not Criterion’s resources be better spent on real art than Hollywood fluff like that? Osaka Elegy is not a great film, and even misses near-greatness, but it shows Mizoguchi as a director with great promise; and it is a fine film. Its major flaws are slight screenplay choices in certain scenes, that seem too abrupt; although this might also be due to editing decisions made later on by Mizoguchi and his editor, Tatsuko Sakane. There are some nicely composed shots in the cinematography by Minoru Miki, but the poor quality of the darkened film transfer hides many of these in a mist of murk. Also, the film’s acting is only adequate, at best. Better actors should have been used for the lead role of Ayako, and especially that of her would be paramour, Nishimura. The younger actors seem barely professional in comparison to those who play the older adults, although Chiyoko Okura, as Sachiko, is actually pretty good; although she has only a few brief scenes; her best coming when her character is engaging with her father. On the plus side, the film’s scoring, by Koichi Takagi, is effective; especially in its use of ambient sounds, rather than a formal soundtrack. Unfortunately, the same print that damns the visuals also renders the non-musical sounds of the film poor; especially during silences, where one can hear a definite ‘static’ in the background. Osaka Elegy is a film that works better in recall than it does actually watching it, which is a good thing. But that does not erase the previously mentioned flaws; it only lessens them. From its opening shots of Osaka nightlife in bright lights, to its end, the film is one which glimpses a world long dead, but one which nonetheless resonates through time. This is what all good art strives for.